We are settling in to sit out the coming storm. I'm enjoying having two extra days to cuddle with my little one, and I am trying desperately to not spend the whole time making mental lesson plans when I should just be enjoying Little Lipstick. Sadly, though, apparently school, my students and their goals are all I think about. I bounce back and forth from applying what I'm teaching in school to Little Lipstick and then just out-right planning what I can do with my students using her books. 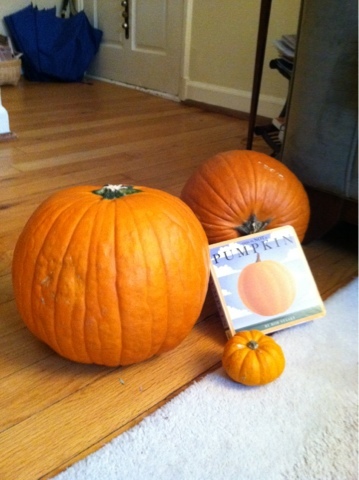 We've got two uncut large pumpkins, one small pumpkin and a board book about pumpkins. While Little L likes to roll the pumpkins around our floor and bang on them I find myself teaching a big/little lesson, drawing connections between the pumpkin in the book and the real live pumpkins. Who knows maybe later we'll get orange paint and paint our own pumpkins and talk about same and different. Won't this be great when we get back to school? The amount of IEP goals and objectives I can get out of this would be huge. I am a monster and I must be stopped! Poor Little L is blessed with two days with her mommy and daddy and all her mommy can do is use her as practice for lessons to teach when we're back at school. And then there is her fabulous collection of board books. So many of her books are very appropriate for some of my kiddos this year. I find myself thinking, "Perfect! I've been struggling with this but this book is the perfect example of teaching x. It is even interactive and lets the reader touch the soft sheep wool." Yes, I keep fighting with myself over whether I'm going to take Little L's favorite board books in and let my students get their big-kid hands all over them. It's hard to reconcile sometimes because in many ways my students need the books more than Little L. She has lots of books. But I don't want her growing up thinking she is coming in second to my job. I don't want her thinking that she isn't as important as the children I teach or my work. I don't want her feeling like she needs to act out or have a disability in order to get my attention. I know this is a long way off, but I want to build a solid foundation with her of being present with her when we have those brief few hours together. Being a working mom is tough and when we only get to be together a little bit everyday I want her to know that she is important. When she's older we'll talk about how she can donate her toys to my classroom for kids in need. But right now, even though she doesn't understand ownership I want to respect the fact that her books belong to her. They really aren't mine to take to school. Maybe because if I don't make a conscious effort to draw a line between home and school I know that school will take over home. I know myself and my work ethic enough to know that unless I purposely stop myself from working I never will, which will benefit the students in my class, but not my own family. It's a fine line. Trust me, I've already ruined Little L's copy of Good Night Gorilla because I've taken it to school (OK, BOTH of her copies have been donated to school). All of her Llama, Llama books have been taken to school and are now well-loved. I'm fighting like crazy to not take in her pigeon stuffed animal because I know when she's older she'll want that pigeon to herself. (But my retelling center needs that pigeon). So I'm going to pray that we survive the storm, work on shutting my school-brain off and just enjoy having two extra days of cuddling and playing with my own daughter. One more day of matching donations from the Donors Choose team- and only $125 to go until our project is funded and my kids can get their hands on materials to act out stories, demonstrate that they can retell a story and answer who, what, and where questions, and become more engaged in our story by adapting text. Type in INSPIRE during check out to have your donation matched! I feel like I'm a bit late to the you tube party- but seriously- there is amazing stuff out there. I'm currently loving Greg and Steve's Good Morning Song, as well as their Days of the Week. Here's Dr. Jean's Who Let the Letters Out- one of my favorite songs. Then there are the color songs- I have the CD but the fact that it's all there with visuals makes it even better. I love that I can just embed the link into my smartboard lesson and we are there in seconds- no fumbling with CDs. I'm sure that the actual artists frown on such things, but right now it's making me pretty happy. So for all of you taking the time to put stuff out there- thank you! We've been in school 35 days and our school still does not have a playground. There have been a number of set backs preventing us from getting a playground, the most recent being that a very, very large pile of dirt has to be moved before a playground can be built. I don't know the specifics, but we were told that there was some confusion over who was suppose to move the dirt. Our administration suggested that we have kids write them letters asking for the dirt to be moved. On Friday we delivered the voice thread and our letters to our administration. Dirt removal was already scheduled to begin on Monday, but of course our students didn't know that. Today at recess our kids stared in awe at the heavy equipment slowly moving dirt off of our playground space. They could actually witness their efforts of writing letters making a difference. (Not to mention the absolutely fascination with watching heavy machinery in general- it doesn't get better than when you have a front row show to bull dozer work). One little girl even called out, "Hey, can you move that dirt, please?" causing an entire conversation between her, the driver, and the other children about what has to happen to build a playground. It is ridiculously frustrating to not have a playground. Recess has been the saddest, most pathetic time of the day- watching our children chase after a few playground balls on the black top. Yet I have to admit- the lesson of advocating for yourself and being a problem solver is worth it. We'll get a playground one day, and when we do our kids will feel like they built it themselves. As my class sat down to write invitations to our writing celebration I assigned one child to address her invitation to the principals. A huge grin spread across her face as she wrote our principals' names and she announced with complete confidence, "They love me." In all the chaos and stress of opening a new school as an administrator - chaos and stress I don't think I can even begin to understand- I have to admit that it is pretty impressive that my kids already feel so much love from our administration. The principal and assistant principal are in our rooms one to two times a day. I know they have a million fires to put out across the building but they drop everything in order to chat with our kids when they run into them in the hallway. Our kids feel loved- which only makes them even more willing and ready to learn when they come to school. If children feel like they belong in a school- feel secure, safe, and valued- they are far more likely to take academic risks and be open to challenges. Last year I submitted a project to Donors Choose asking for materials so that my students could act out familiar stories. After receiving your generous contribution and getting the materials I was amazed at what my students could do as they acted out the stories! Children who otherwise were not able to answer what came first, second, or third in a story were able to use physical objects to demonstrate that they truly knew what was happening in the story. They acted the story out in order, showing that they were understanding the book even if they hadn't been able to answer questions about the text. After watching the success my students had using the materials I knew I needed more objects to adapt more of our stories. I have started another Donors Choose project asking for a play house, a play barn, and people who can be used to act out more stories. These toys are also used for practicing our speaking- using words and following directions that involve in/out, up/down, and labeling objects in a way that supports their speech development. In this project I am also requesting fabric, Velcro, and other objects we can add to the pages of our books to make them more accessible and engaging for students with intellectual disabilities. I'm learning a lot about how to adapt texts to meet the needs of my students and I'm excited to apply what I'm learning. Thank you for considering donating to this project! I can't wait to see what my students do with the materials once the project is funded. Not to be a broken record, but I strongly dislike prepackaged reading programs. I don't like the way they script lessons, or how it takes thought and planning away from the teacher. I don't like how they encourage me to be passive, or how they follow a formula that isn't based off of the kids in the class. I associate them with lazy teaching. I've written about this quite a bit and I know you're probably tired of hearing me whine about them. There are some programs I don't mind. I am a fan of Early Literacy Skills Builder as well as LLI (OK, for LLI I really just like the books it supplies to use as guided reading books. And it's software. And that it does encourage teacher thought). But I still don't fully buy into the concept of using a program. I've had years of quality literacy training. I don't want to give myself too much credit, but I like to think of myself as a good reading teacher. 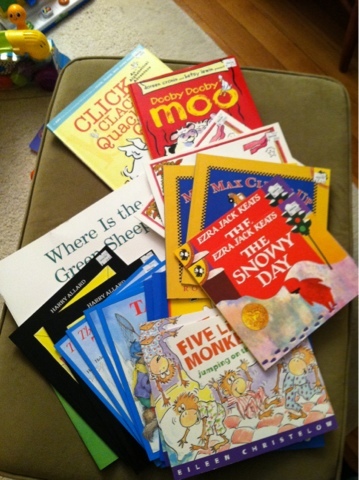 Teaching emergent reading skills- it's something I can do. I understand how kids learn to read and I can design instruction based off what small skills and steps they need to take to get from point a to point b. Now that I'm teaching in a program for children with Intellectual Disabilities I have to re-look at how I view teaching reading. I am teaching children whose parents and teachers decided traditional methods in a traditional classroom were not going to work, so it would be important for the child's education to be in another setting with different instruction. That's not something I can overlook lightly. It doesn't mean I can't teach traditional guided reading when it is appropriate, but it does mean that I need to take into account the possibility that it might not be appropriate. I'm torn between whether or not to use a program for a few of my students. We can do traditional guided reading- which I love and feel I am good at teaching. Or I can use a boxed program, or some combination of the two. The children in question are learning decoding skills, which is traditionally difficult for students with intellectual disabilities. The more we dive into practicing these skills the more I see just how difficult it is for my students. The special ed solution to this difficulty is to teach whole-language and teach specific words in isolation. Despite my personal aversion to programs that teach words in isolation I want to do what is best for the children. Am I holding them back by trying to teach them to decode words? Or am I slowly building a strong base of literacy skills they will be able to use and apply to all words? Can I adapt my guided reading plans and a boxed program to give the students both whole-word instruction and decoding skills? I realize what a gap I have in my understanding of how children with intellectual disabilities learn to read. I've been introduced to the programs but I've never been taught why these programs are chosen over others. What in the neurological development makes it difficult for children to learn to decode words and makes whole word instruction better? What is the research on these programs that shows the benefits of teaching one way verse another? I don't want to limit my children's skills but I also don't want to limit their opportunities for growth. I worry that if I teach them using whole-word instruction that we can't go back and teach decoding principals. I want them to be able to understand sounds, rhymes, and word play. I don't want to give up on those skills just because they are in our program. I'm trying to find a way to balance both the pre-programmed kit and the student-driven guided reading in order to give my students the best of both worlds. There are those moments in teaching where you take a step back and observe yourself as an outsider might- and at those moments you are pretty sure that you would be committed to a mental institution for serious help if anyone else came along. Or just fired, no questions asked. Yesterday I stood at recess in my fancy-I-have-an-important-meeting-so-I-will-for-once-look-professional-shoes (IE high heels). My teammates and I stood back smiling, saying silent prayers to the recess gods for allowing it to stop raining in time for us to go play on the black top and get some of our Friday energy out. The sun even came out so that we could see our shadows (ever since a science experiment where we made shadows with flash lights we've been obsessed with shadows). The kids were running around chasing each other and screaming, which is technically against the rules (no tag games) but it is so rare for our kids to actually play together and interact like typical kids that we overlooked the pesky rule. Then I saw that one of my kids wasn't playing with everyone else, but was watching them intently. Finally I realized that she just didn't know how to begin playing with them. She could see that they were having fun and she wanted to join in their game, but she didn't know how to begin. Wanting to teach her play skills that she could use both at school and at the playground near her house I walked over to encourage her to join in the game. Quickly I knew this was going to involve me joining in the game was well. After prompting her to ask if she could play we took off. Grabbing her hand we ran across the blacktop, my blue fancy heels clicking as we went, yelling, AHHHHHH, the zombies are getting us! AHHHHHH, run! as my friend in a wheelchair drove after us pretending to be a zombie. From a PC standpoint it was a pretty awful game. For one, our school doesn't celebrate Halloween so I am pretty sure playing 'zombie' on the playground isn't really appropriate. Then there is the fact that the 'zombies' were one child in a wheelchair and another child with Down syndrome Not to mention it was a game of tag which of course is a big no-no in schools these days. So there I am, the teacher, running in my heels, encouraging other children to play zombie tag and run from the children with the most obvious disabilities. It LOOKED terrible. I can see myself defending my actions to the school board now. However, the kids really were taking turns being the zombies- it just so happened that when I joined the children with the most obvious disabilities were the zombies. Of course the kids in our classrooms didn't blink an eye- they weren't thinking- get away from the kid in the wheelchair- they were thinking- hey, it's his turn to be zombie- run! It was the most age-appropriate free play I've ever seen out of my kids. Sure it wasn't totally PC, but how many kids on parks outside of school play total PC games? The kids in our program need to have social skills so that they can interact with their typical peers outside of school as well. If we only teach them to play teacher-led and teacher-approved games we'll only separate them further from their peers. Sure teacher-led games will look pretty, but childhood isn't always pretty. If our kids need to be taught how to play zombie tag, well, let's do it. The smiles on our kids faces said it all- everyone was excited to take a turn to play zombie- to actually interact with each other instead of standing around passing a ball in a teacher-led (and let's be honest, boring) activity. For once recess looked like a typical general education recess, complete with squeals and laughter. I loved it and they loved it. My feet, however, did not. The blisters were totally worth it though. Labels: play, teaching social skills, what was I thinking?, whats really important? I normally love your products. The way the marker gently glides across a clean white board, leaving a bright, bold letter behind. The satisfying click the top makes when I remove it in preparation to write. The bright colors that stand out across the room so that all my students can see. Really, I have few complaints. Why, oh why, did you make scented markers? You have no idea the distress I feel when I grab a marker, pull off the top in the excitement of writing for my students and am suddenly hit with the strong scent of strawberry or blueberry or whatever it is you imagine those colors to smell like. I can't remember what I am writing. I hold my nose. I try not to breath in. The children scoot closer to me wanting to smell whatever is radiating from the marker. When it is their turn to use the markers I find little blue and red marks on their noses. I hate to think about the germs being spread nose to nose as they are getting high from expo marker sniffing. Why, oh, why did you decide to make my life harder? Isn't teaching hard enough? At the end of each day I put one of my students on the bus and strap him into his seat. After I've given him his "high five for a great day" and am heading down the stairs he almost always calls out, "I love you, Ms. Lipstick." And no matter how tired and stressed and overwhelmed I am my heart melts a bit. It's at that exact moment that I know I have the best job in the world. A few years ago I joined other educators around a table to discuss a preschool student transitioning to kindergarten. Two of the educators at the table were the student's teachers- one had him in the morning in a small special education class with five other students. The other taught the student in the afternoon in a general education preschool class with fifteen other students. As the meeting progressed the two teachers stared at each other in disbelief and horror. They each described a very different student. The special education teacher described a young boy with no academic skills. A boy she felt may need to be placed in an intellectual disabilities classroom down the line. The general education teacher described a bright, though shy boy with many academic skills- a boy who could write his name, count to 10 and knew his alphabet. Neither teacher could believe that the other one would be so blind toward the child in question. They each truly believed they knew the child- they'd taught him all year. They were both experienced educators who have a good understanding of child development. Yet their years of experience gave them each a different perspective on the child. The following year when I supported the boy in his general education classroom I found a very bright yet shy boy who was able to count to ten, say his alphabet, build anything anyone put in front of him, and write his name. I watched him shut down when the speech pathologist worked with him and I watched the speech pathologist form an opinion of him much like his preschool special education teacher's opinion. From her years of experience she saw a boy with limited functioning. Eventually we helped the student get comfortable enough with her so that she too could see his bright sparks. The special education teacher and the speech pathologist were not wrong- they made their judgments based off of what they observed. In the special education setting the boy had never been asked to count to ten, write his name, or say the alphabet. He was never given the peer models to show how to behave and therefore his shy, quiet mannerisms morphed into what appeared to be a cognitive disability. Yet in the general education classroom he followed his peer models, overheard the alphabet song being sung, and attempted participating in classroom activities like writing his name. He was given the chance to try these activities so he rose to the challenge. This experience haunts me this year as I watch the students in my class. I fully support the intellectual disabilities self-contained program but I also realize it has its limits. I worry that my students will not be exposed to activities and lessons their general education peers are exposed to and that this lack of exposure will further separate them from their peers. They may be fully capable of learning and performing academic tasks that their peers can perform, but since they are not being exposed to it they never will learn how. Last year I tried very hard to model my classroom lessons after what was happening in the general education classrooms. I wanted it to be as similar as possible so that my students would be exposed to everything their gen ed peers were exposed to. I differentiated for them so that the lessons met their needs, but I also followed much of the same lesson structures and demands of the gen ed classrooms. Last year I was a part of the gen ed kindergarten team and so I was able to follow the gen ed curriculum closely. This year, sadly, I am not a part of any of the gen ed teams because of time-demands. I am teaching specific, scripted programs that do not allow us to follow the gen ed curriculum. I am terrified that all of this limits my students and that I am becoming that preschool special education teacher who believed a student was not capable of activities he had mastered solely because she never asked him to do them. I hope that merely being aware of the problem will help me remember to constantly challenge my students, but I have the sinking feeling that it is not enough. For 8 years I protected my students from teacher manuals. Every lesson I taught was based on what I observed the students doing, what I wanted them to be able to do, and the skills I knew they needed to get from where they were to where we were going. They were not half hearted lessons- everything was plotted out and analyzed from the intentional language I used with the children to the specific materials. In so many ways lesson planning (especially if it is co-planning) is my favorite part of teaching- creating the lesson plans, analyzing the skills, putting it all together so that children are able to learn. I love looking at my data, analyzing where my kids are and plotting my next steps. It's creating a road map for student success. Unfortunately, in special ed, I'm learning that the system of letting the teacher plan out the lessons is not how we roll. I began to learn this last year but it was just in reading. I didn't like it, but I could see the value in bits and pieces. I could see how it was taking away some of my thoughtfulness as a teacher and in turn making my instruction less student focused. This year it's a whole new ballgame- every subject has a program and is scripted. Even science. I find it physically painful to be forced to use a teacher manual. As though I'm not capable enough of determine what to teach when- or- for our scripted lessons- what to SAY when. What did you hire me to do? Apparently to read and turn pages. Since I don't actually get a planning time or a chance to sit down with my team I can see where the scripted lessons have some value. Apparently special education teachers aren't expected to have time to plan, so instead we can just turn the pages of the manual. We're in the "don't think, just do" category of teachers. If we've been hired to be warm bodies in the classroom then nobody needs to worry about what we teach if they just give us a scripted lesson. I began our scripted science curriculum on Tuesday. I dove into the lesson head first. It is my first year teaching students with intellectual disabilities. Who knows, maybe the lesson would actually rock. People spent a lot of time and effort creating it- it should be awesome, right? I tried. I really did. I read the script. I turned the pages. I spoke when it told me to speak and I waited for student responses when it said to listen for student responses. When I looked up from the manual I was faced with the yawns and glazed-over eyes of my poor students desperately trying to pay attention. It was the first time I can honestly say I saw them bored. Even my aid was yawning. The next day I taught the concepts but threw in my own spin and actual lesson. It went better- less yawning, more participating. Today, after realizing the experiment they'd so nicely scripted out for us did not actually work, I created my own lesson. Much, much better. I understand that special ed can be a scary place because of the legal ramifications I understand that legally school districts get scared of what their teachers are doing and it is easier to give scripted "research based" programs instead of asking teachers to use their professional judgement. When we do that, if kids don't learn what they need to learn we can all shrug our shoulders and say, "Well, we gave them a research based program". It takes away some of the scary unknown of letting a teacher decide how best to approach a subject of a student. It makes everything nice and easy- literally fitting into a box that can be taken from room to room. As teachers we are better than scripted teaching program and our kids deserve more than programs that encourage us to not think about what we're doing. The general education kids get teachers who are thoughtful about their teaching. While still teaching standards those teachers are trusted to analyze and plan their own instruction. They are able to get together as a team and decide how best to approach teaching a topic. They are given the task of bringing everyone to a certain level by using their professional wisdom. Why can't the special education students be given the same courtesy? Why can't children with special needs to given teachers who also plan, collaborate, analyze, and are deliberately thoughtful about instruction? There may be nothing that makes me feel more bipolar than my job. The highs are oh so high and wonderful- and the lows? Oh my goodness. The lows make me want to run and hide under a rock and never ever come out. Not even for ice cream. On Thursday I left school with an incredible high. One of my little ones was spontaneously communicating in ways he never had before. He wrote his name for the first time ever- independently- and I just couldn't believe it. Baby steps. Each little step is something, but in this line of work we celebrate every inch. Thursday I finally felt like I belonged right where I was- in this school, in this classroom, with these kids. But Friday? Friday was a disaster. Friday I felt that I should fire myself as a teacher. The kids would be better off with someone else. My family would be better off if I let this job go. My teeth, oh my poor, grinding teeth. There may be nothing else left after this year. The day started with realizing that my brand new building was lacking a very important, very expensive computer program that I absolutely had to have to complete extremely important paper work that had a very important deadline. So through emails we all frantically tried to figure out a way for me to run back to the think-tank on my lunch break so I could plug my data into their program. Of course while I'm worried about how I'm going to find coverage, make sub plans, eat lunch, and somehow manage to use this computer program one of my kiddos is having a BAD DAY. And it tends to be that when you have a bad day in my class everyone has a bad day because regulating our emotions is something everyone is working on. So we are all trying our hardest to survive the BAD DAY. I'm trying to manage the email chain and talk to the adults coming into my room who are dealing with the computer software issue. I am scheduled to have one of the reading specialists come into my room to do a lesson that I am super excited about so I'm trying to keep us on task so that we'll actually be finished with everything we need when she comes in. I finally got one of the assessments that I was suppose to complete in September so I'm also frantically trying to assess everyone of my kiddos (keep in mind that it is a BAD DAY so the assessments are often interrupted with shrieks from across the room). I am trying to hold it together and one of my kiddos keeps telling me she's sick. She's very dramatic so I ignore this. Yes, I've learned this lesson a million times. When I was a gen ed teacher I was thrown up on after I denied a child a chance to go to the clinic. But- we all know what happens when you let one kid go to the clinic- the rest of your year is spent trying to figure out whose really sick and whose not sick. The child didn't feel hot- she seemed to be her normal self- so I ignored her request. "Let's see how you feel at snack time" I replied- because if they are still sick at snack time then you know they are really sick. A child once drew this picture of me. Yep, me. And it is how I felt about myself on Friday. So yes, at snack time I finally break down and send her. Yep- a fever. So not only did I make that poor girl suffer through reading workshop but I exposed the rest of the class. Teacher. of. the. year. I fire myself. I manage to make it to and from my old school in minimal time and get the information I need. This means of course that I don't eat my lunch and I don't have time to prep for my afternoon lessons. As everyone stares at me from the rug and I wonder what we're going to do next I decided that we'll do some interactive writing because, hey, it keeps us busy and it involves minimal materials. I'm trying to manage the BAD DAY behavior while peppily saying "Hey kids, what sounds do you hear in 'time' Let's stretch it out like a rubber band? OK- ready.... ttttttiiiiiimmmmmm" when OH MY APPLE PIE one of my friends yells out "I hear a T"
I fall over. I didn't know he knew what a T was. I mean, I swear yesterday he saw a T and said "4". "Great!" I smile. "What do we hear next?" The same usually quiet and reserved child shouts out, "I"
And then- "M, like mouse". In the same moment I want to cry because the BAD DAY is still happening and we all have headaches and I haven't eaten and I have no idea what I'm going to do after we write the word time and I'm overwhelmed and frustrated and I don't feel like I am being the teacher these kids deserve. And yet- my friend matched sounds with letters. HE MATCHED SOUNDS WITH LETTERS. It's not even bipolar anymore- it's just confusion and craziness because I no longer know what to feel. The frustration mixes with pride and happiness. I hug my friend and high five everyone. I try not to cry and ignore my growling belly and all my stress. Labels: baby steps, special ed paperwork, stress, whats really important? I put myself in time out today. It wasn't pretty. I looked like Trixie in Knuffle Bunny when she can't communicate to her parents that she left her bunny in the washing machine (spoiler alert) and she's pissed because OH MY GOSH how is her father actually not realizing that they left the laundry mat without her special bunny?? Now that my own life is ruled by a "anda" (or panda for those of you who prounce your p's, I honestly don't understand. If you want happiness you immedietely check for 'anda. Anyway. Yes, I had my own hissy fit. The best part was that I managed to record it. I was excited all weekend about finally starting voice thread with my kiddos. I've had it all loaded and ready to go all weekend, just ready for us to retell Mrs. Wishy Washy with all of our excitement. So I gathered everyone at the table, pulled up voice thread and hit record. Or hit what turned out to be 'please record in exactly 90 seconds'. So by the time it actually started recording us it caught"
GRRRRRR I am SO ANGRY at this computer! What is WRONG with it? In the midst of my outburst (remember- in front of all my kiddos) voice thread decided to start playing back what I'd recorded. Out of nowhere I hear, "GRRRRR I am SO ANGRY..."
We all fell silent listening to me yell at the computer. I felt their big eyes staring at me, wondering what had happened to their teacher. And so, I realized there was only one answer. I marched myself to the thinking spot and had them coach me through getting myself back together. What do I do next? Deep breaths? OK. Here I go. If I'm honest, I needed that break. I needed to take those breaths and calm my body before I did something crazy like throw my computer across the room. There are moments when it is wonderful to be in a place where it is completely socially acceptable to put oneself in time out in order to calm down. Perhaps I should do this more often. Like when I'm getting a list of all the mandated testing required for the month. After my series of Saturday home visits this fall I've been struck by the former school experiences of all my families. They have so much to tell me- so many disappointments or frustrations, so many times they've been disillusioned by our school system. In order to be in our program for students with Intellectual Disabilities the IEP team must decide that the least restrictive environment is a different program that the neighborhood school can provide. It's not a decision that should be taken lightly by any team, and one that many times is come to after the neighborhood school and the student have proven to not be a good match. The stories are heartbreaking from a parent perspective. In many of them the school did nothing wrong, but the situations were still not ideal. I cannot imagine how it must feel as a parent to hear that your neighborhood school- the one you watch all the other kids in your neighborhood come and go from happily- is unable to meet your child's needs. Stories of teachers admitting they don't have the answers- of frustrated parents wondering what's happening when they are not around- of students trying to fit into a situation where they do not feel comfortable. Most of these are situations where no one did anything wrong. No one is at fault. It's not lazy teachers or bad administrators or overly demanding parents. The situations just are what they are. Families try the neighborhood schools first. It's how IDEA, the federal special education law is written- the least restrictive environment should always be in place, and many times in order to determine that environment a student has to try being at their neighborhood school in the general education population first. My heart breaks for these parents and their stories. It's also terrifying as a teacher. I want to give my families the most positive school experience possible. I want them to have that happy, confident child who comes off the bus bursting with achievements to share and stories to tell. I want to communicate all their children's strengths while also being completely honest about their growth areas.